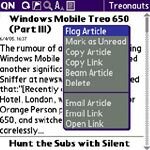 I use the word 'redefined' in the title of this post because there really is no other way to describe the leap that has been made in RSS reading on our Treo thanks to Quick News - without a doubt one of the best applications to emerge for our Treo in a while. 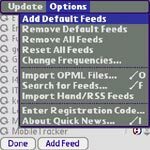 After installation, Quick News (previously known as HandRSS) initially opens to a 'Feed Setup' page which allows you to choose from setting up either 'Default Feeds' (chosen by the developer), to 'Search for Feeds Now' (which queries the syndic8 database) or to 'Import OPML File Now' (from your existing RSS newsreader) - you can also add feed URL's manually elsewhere. If you're just getting started with RSS readers then the 'Default Feeds' will provide you with a flavour of what to expect. Next, I personally find the syndic8 database limited so I did not add any feeds using 'Search for Feeds Now'. However, the 'Import OPML' function proved an incredible time saver for me as I simply exported my Bloglines subscriptions (you must save the file as .opml and not .xml). One thing to keep in mind when adding or importing feeds is that Quick News cannot save these to your memory card so each one may use, on average, up to 100K of your available memory on your Treo. One should therefore probably limit the number of feeds to no more than a reasonable 50 and I would personally suggest filtering it to your 20 most important news feeds. Although I personally have 53 feeds set up, it also makes sense to limit your feeds because on the one hand they will be updated upon each HotSync (unless you disable this) typically adding a couple of minutes to this and on the other hand because once your feeds have been hotsynced in raw format they are 'imported' and converted when you launch Quick News taking between 1 and 5 seconds per feed to complete (my 50+ feeds therefore open in about 2-3 minutes). Additionally, a word of caution. Because of the way the feeds are downloaded from raw data you should allow a 'memory buffer' approximately equivalent to the size of your actual feeds so that if they use 2MB you should allow 4MB of available memory for Quick News. In the same vein, you probably will not want to use the OTA option if you don't have an 'unlimited' data plan as your charges will quickly add up. This isn't great but I believe that Quick News' excellent features and functionalities more than make up for this limitation. Once you've completed your feeds setup, Quick News opens to the 'Feed List' view where you'll be able to set your update preferences - either HotSync or OTA (Over-the-Air), edit, view, manually update, reset or delete your feeds. 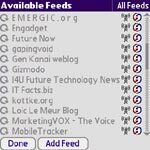 Additionally and conveniently you can easily add or remove all the 'Default Feeds' which you might have installed. Once you've selected a particular feed to read from the Feed List it will open a new window and provide you with three viewing options: an 'expanded' view where the full text of each post is displayed, a 'collapsed' view which only displays your posts' titles and a 'boxed' view which list all the titles at the top while displaying the relevant text at the bottom. I really appreciate the fact that Quick News provides me with this many viewing options but personally I found the main 'expanded' view to be the most straightforward and simplest to use - particularly once you get used to the excellent keyboard shortcuts such as 'space' to quickly jump to the next post. TIP: Furthermore, you can type any letter on your keyboard which will bring up a small 'pop-up feed browser' which takes you to the first available feed for that particular letter. You can then use the up/down in your 5Way to navigate to the next feed that you would like to read. Additional customization can also be made via Options > Preferences for the order in which articles are displayed, the frequency of Auto Updates (if any), your download preferences, shortcuts, colors, connection and backups. Flag Article: places a small flag next to the post and also lists that post in a dedicated 'Flagged Articles' section which aggregates all of these. Mark as Unread, Copy Article, Copy Link and Delete are straightforward. 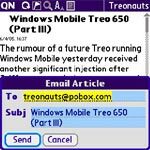 Beam Article: allows you to send a particular article to another Treo where it will be imported into Notes. 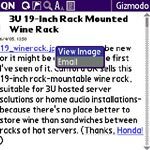 Email Article: this is an absolutely great functionality which integrates extremely well with your preferred Treo email client opening the application and returning to Quick News once the mail has been sent. I have found this particularly useful when reading my feeds on the go, quickly emailing it to myself and then following up from within my inbox. Particularly useful is the option in 'Web & Mail' allowing you to set a default 'email to:' address so that you don't have to repeatedly enter this manually. Email Link: does the same as above but only sends the link as opposed to the entire text of the article. Open Link: integrates with your preferred browser and takes you straight to the originating blog or website. Additionally, Quick News also allows you to view images that may be in your articles as well as downloading enclosures such as mp3 podcasts. Images are opened with a built-in image viewer while you can select your preferred mp3 player to automatically listen to your podcasts once they've downloaded (awesome). 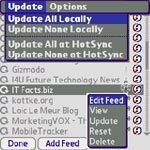 At present all podcasts must be downloaded manually and only work with OTA but a future version of Quick News may very well be able to use HotSync to download your enclosures - something which would be very cool indeed. I have found Quick News to be an ideal RSS newsreader, often preferring it to my desktop one - which should tell you a thing or two about how good I think it is. 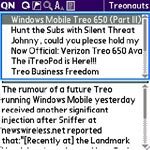 Were it not for the current limitation that all articles must be kept in the main Treo memory (enclosures can be saved to the card though) there is no doubt that I could envisage adding all of my feeds to Quick News and not just a selection. If you're serious about keeping updated with news, already use an RSS newsreader or are just getting started with the whole blog thing and would like to experience one of the few applications which is genuinely 'Treo-optimized' then you cannot miss to get Quick News. You can download a trial or buy your copy of Quick News which is currently on offer at $12.95 in the Treonauts Software Store. You could also use the mobile version of Bloglines which works like a charm in Blazer and requires no extra memory. I use it regularly. I just downloaded the Quick News free trial on my Windows XP machine. It ran fine (that is, it didn't report any errors), but after syncing the app was not on my Treo 650. I tried opening start->All Programs->Stand Alone, Inc.->Quick News Manaul and got a "Missing Shortcut" dialog. I tried uninstalling and installing again (and I quit and restarted HotSync Manager by hand) and had the same problem. I don't disagree with you that Bloglines is a terrific solution. However, given the choice between using Bloglines mobile with Blazer (http://www.bloglines.com/mobile) and Quick News I would choose the latter any day. I have stuck w/ mobile Bloglines as well, primarily for the fact that it is always in sync - if I read something on the treo, it doesn't show up unread when I go to bloglines from a PC. It would be great if a reader like this could provide that kind of synchronization with bloglines. Well, here's another mobile RSS reader for you to check out. It's called FreeNews and it's currently in Public Preview. We're looking for feedback, so please take a look and let us know what you think. Thanks!